This is probably the finest walk on the Dent de Crolles, and shouldn't be missed. It includes (map) viewing the entrance series of the Guiers Mort cave; a visit to the summit; and an exploration of the prairie on the Dent de Crolles summit pastures. It is, however, a full day's walk, and you should expect to be away from the car for up to seven hours. It also needs to cross the Guiers Mort stream which is impassable in flood conditions. Once up the zig zags (or across the short traverse), cross over to the imposing entrance (1310 m) which you will reach about an hour after leaving the car. This is a lovely spot, and a good place for breakfast. The Grotte du Guiers Mort is the bottom entrance to the world-famous 60 km long Dent de Crolles system of caves, and its entrance chambers may be explored safely providing you have adequate lighting (which includes a spare), and the water levels are reasonably low. If you follow the main passage up some boulders and round to the right, you will arrive at a large chamber with a lower passage going off at floor level. Entering this, you are immediately hit by a veritable gale-force draught. The low passage only lasts three or four metres before entering another high chamber. This is the Climber's Chamber, which is as far as we can go, but speleologists can progress into the heart of the mountain by climbing up to a passage in the roof. Once the cave has been explored, you need to reach a path which ascends following the base of the cliff. You can reach this from the cave mouth either by clambering across an eroding gully, or more easily by returning to the stepping stones and climbing up to it via a number of zig zags on the (true) left bank. After another ten minutes, we meet a junction. Straight on leads to the bottom of the Dent de Crolles prairie - we, however, take the path to the right which is the start of the Sangle de la Barrère. The rock strata rise steadily up to the summit from here, and the path follows a ledge system traversing high up the southern cliffs. It isn't exposed, but the situations are superb. In spring, the fine bear's ear primroses are commonly found, clinging to crevices in the cliffs. The path finishes a few metres below the top of the Pas de l'Œille path. Finishing up this and turning right leads to the summit, (2062 m) about an hour after starting up the cables. On a clear day, the views from the summit are spectacular. The Belledonne hills can be seen over the haze-filled Isère valley to the east, and 100 kilometres to the north-east, the white mass of Mont Blanc seems to be hovering in the sky. To the north, west, and south, the Chartreuse and Vercors massifs fills the near and far horizons. For the descent we will make our way back to the GR9 and follow that north to pick up another path that returns to Perquelin. Follow the shallow valley down from the summit, as whim dictates. You can either follow one of the paths, or meander through the lapiaz. If you choose the latter, you may spot the P40 pothole, which is the original top entrance to the caves underneath. It's a 30 metre deep shaft, a little too wide to jump over, with a plaque fastened to the wall. 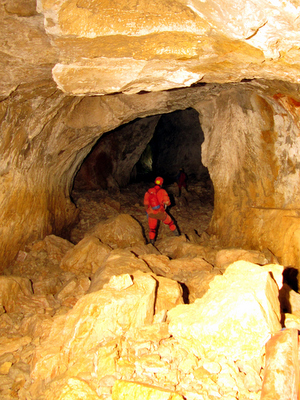 Experienced cavers can descend this shaft, to emerge either at the Trou du Glaz, or the Grotte du Guiers Mort over 600 metres below, according to taste. After half an hour or so, you will reach a signed meeting of four ways near the bottom of the valley. Straight on leads up to the Belvédère, which is a high point on the ridge, and as its name implies, is an excellent view point. To the left the GR9 emerges onto the plateau having climbed up from the Trou du Glaz (passing the start of the Sangle de la Barrère en route), and to the right, it heads towards the col du Bellefont. Turn right, and follow the clearly way-marked path through the beautiful prairie, surrounded by dwarf forest, beautiful views, and, in season, a riot of colour from the flowers and butterflies. This is walking at its best. Half an hour after leaving the sign post, you are faced by an impressive cliff face descending from the crest to the right. The way on finds a pleasant rake through the cliff, and then traverses a steep bit of prairie. After a further 15 minutes you reach le Prayet, a flat meadow area with a well decorated tree. The GR9 continues to the north, and we turn left towards the cirque down the Sentier du Colonel.